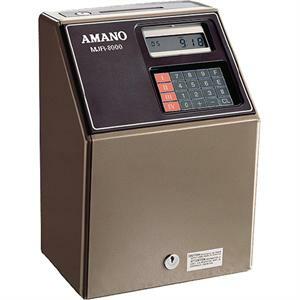 The Amano MJR-8000N is the unrivaled champion of calculating time clocks. This clock is a reliable time clock that does the calculations for you, also separating overtime hours, saving you time and mistakes during your payroll process. It's durable steel case, steel frame and superior electronics and design make this a workhorse among all time clocks, suitable for companies of all sizes and environments. The MJR-8000N accommodates up to 250 employees and has features and a track record of reliability no other time totalizing time recorder can match. The clock uses the special numeric timecards with a series of 0 to 249 to track the hours (can be programmed to use other numbers, but only up to 250 in sequence). Calculates employee times right on the time card. After each out punch a daily total and accumulated pay period total is registered on the time card. Accommodates weekly, bi-weekly, semi-monthly and monthly pay periods. Automatic carry over of worked hours amount for overtime calculation in semi-monthly and monthly pay periods. Definable paid break feature and revision zones. Unlimited punching - clock knows when front of card is filled and continues automatically on to the back side if needed. Calculates actual time (minute to minute) or rounded time. Automatically adjusts for long/short months, leap year. Anually Programable dates for Daylight Saving Times. Optional Signal Interface for Bell/Horn sounding. Dimensions: 13.5" x 9.5" x 8"